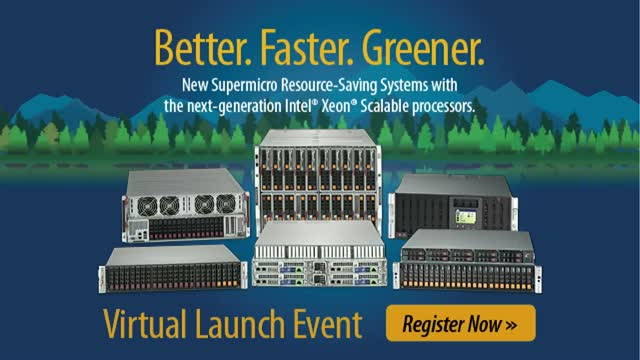 Join us live for the Virtual Launch of the latest Supermicro Resource-Saving Systems powered by the next-generation Intel® Xeon® Scalable processors and Intel® Optane™ DC Persistent Memory. Register today to hear about our entire X11 portfolio being optimized to fully leverage the next-generation Intel® Xeon® Scalable processors and future innovations including Intel® Optane™ DC persistent memory and Intel® Deep Learning Boost technology to enable more efficient AI (artificial intelligence) acceleration. Charles Liang founded Supermicro and has served as President, Chief Executive Officer and Chairman of the Board since the company's inception in September 1993. Mr. Liang has been developing server system architectures and technologies for the past two decades. From July 1991 to August 1993, Mr. Liang was President and Chief Design Engineer of Micro Center Computer Inc., a high-end motherboard design and manufacturing company. From January 1988 to April 1991, Mr. Liang was Senior Design Engineer and Project Leader for Chips & Technologies, Inc., a chipset technology company, and Suntek Information International Group, a system and software development company. Mr. Liang has been granted many server technology patents. Mr. Liang holds an M.S. in Electrical Engineering from the University of Texas at Arlington and a B.S. in Electrical Engineering from National Taiwan University of Science & Technology in Taiwan. Lisa Spelman is vice president in the Data Center Group and general manager of Intel® Xeon® processors and data center marketing at Intel Corporation. She leads the Data Center Group’s product management, solutions portfolio, and technology enablement across Intel’s diverse data center market segments. Her organization’s responsibilities encompass delivering marketing plans and strategy, hardware and software enablement, and go-to-market engagement. Cognitive computing fuelled by Deep Learning has had a profound impact on our lives by helping to solve everyday problems through advanced technological breakthroughs. This transformative computing method is being deployed by Fortune 500 companies looking for creative ways in which to solve business problems as efficiently and accurately as possible. • New Supermicro Cloud-Managed Gateway solutions designed to enable business' to drop-ship and instantly provision Supermicro devices at thousands of locations. • Securely adding new services to edge gateways and how they can be as easy to deploy and update as adding an app to your smartphone. The Resource Saving Architecture operates in a large-scale datacenter environment leveraging Supermicro Rack Scale Design (RSD) to manage racks of disaggregated servers, pooled composable storage, and networking with industry standard Redfish management. When viewed over a three- to five-year refresh cycle, disaggregated rack scale design will deliver on-average a higher performance and more efficient servers at lower costs than a traditional rip-and replace model by allowing data centers to independently optimize adoption of new and improved technologies. Join us to learn how Resource Saving Architectures’ Rack Scale Managment can benefit your datacenter deployment today. Supermicro’s Resource Saving Architecture continues our tradition of leading the market with Green IT innovation that helps the environment as well as provides TCO savings for our customers. We have introduced an overall architecture that optimizes datacenter power, cooling, shared resources and refresh cycles. This innovative approach focuses on a disaggregated server architecture that reuses system enclosures and extended life subsystems while enabling the modular refresh of CPU and memory. By disaggregating CPU and memory, each resource can be refreshed independently allowing datacenters to reduce refresh cycle costs. Multi-node power and cooling technology helps to reduce operating costs in the data center by up to 50%. Resource pooling and storage provisioning can help increase capacity utilization and reduce costs by up to 45%. Join us to learn how Resource Saving Architecture’s disaggregated server architecture featuring Intel technology can benefit your datacenter deployment today. IT managers are increasingly seeking out suppliers of high performance, cost-effective and energy-efficient Green IT products to primarily reduce skyrocketing data center operational costs, a large proportion of which are energy related costs. Supermicro’s Resource Saving Architecture continues our tradition of leading the market with Green IT innovation that provides TCO savings for our customers and helps reduce TCE – the Total Cost to the Environment. We have introduced an overall architecture that optimizes datacenter power, cooling, shared resources and refresh cycles by enabling the modular refresh of subsystems and using optimized extended life subsystems. Join us to learn how Resource-Saving Architecture can benefit your datacenter deployment today. Live webcasts on end-to-end green computing solutions. Supermicro provides end-to-end green computing solutions for the data center, cloud computing, enterprise IT, big data, high performance computing and embedded computing.